Media captionFirst Minister Nicola Sturgeon said a no deal on Brexit was "unthinkable"
Nicola Sturgeon has described a no-deal Brexit as "unthinkable", saying that "no Brexit is preferable to no deal". 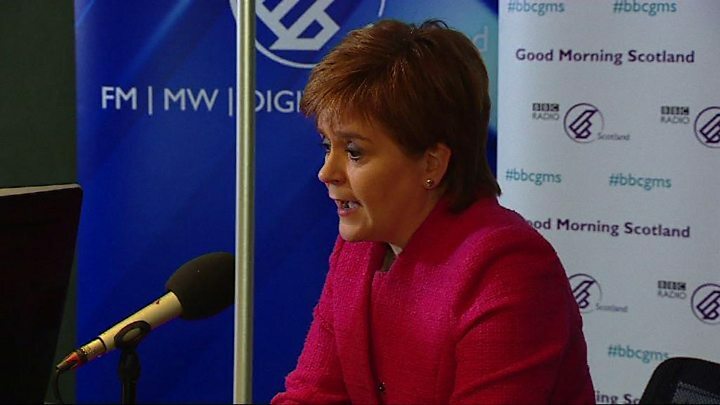 Scotland's first minister called Brexit a "horror show", saying she was seeking the "least damaging" outcome inside the single market. Theresa May is said to be considering appointing a minister for a no deal Brexit in a reshuffle of her cabinet. But Ms Sturgeon said this approach "beggars belief", saying Ms May was "appeasing hard-line Brexiteers". The Scottish and UK governments have been locked in dispute over the UK's exit from the EU, with Scottish ministers refusing to put forward Westminster Brexit legislation for consent votes at Holyrood until a deal is struck over powers returning from Brussels. Newspaper reports have speculated that the prime minister is set to appoint a junior minister to examine the possibility of the UK leaving the EU without a trade deal, as a move to demonstrate to EU leaders that she is serious about this as an option if talks fail. Ms Sturgeon told the BBC's Good Morning Scotland programme she had read the reports "in disbelief" and "despair", saying: "It beggars belief. It seems to give the impression that the UK government think this is some sort of game, that Theresa May is more concerned with appeasing the hard-line Tory Brexiteers than she is about acting in the best interests of the country." "No deal is unthinkable. Let me be absolutely clear, no Brexit is preferable to no deal." The Scottish government is to set out papers later in January analysing the different possible outcomes of Brexit for Scotland's economy, including single market membership, a free trade agreement with the EU or no deal. Ms Sturgeon said: "There's no doubt at all that staying within the single market, staying with the customs union is not the best outcome - staying in the EU in my view is the best outcome - but it's the least damaging outcome. "I think 2018 has to be the year where we see jobs, the economy, the protections that come from EU membership like workers rights, consumers rights, really come to the fore, and the Tory Brexiteers sidelined rather than given greater precedence." Ms Sturgeon said she would "make an assessment and come to a judgement" about a possible Scottish independence referendum "once we see the outcome" of the next stage of Brexit negotiations. On the prospect of a second EU vote, she said this was "not the position of the SNP, it's not a policy we're campaigning for", but added that "as the situation develops, the argument for giving people a say on the final outcome may become irresistible". She said: "This is where the EU referendum in 2016 was very very different to the Scottish independence referendum in 2014. In 2016 there was no detail about what the future relationship between the UK and the EU would be if there was a vote for Brexit, and we go into 2018 and we still don't have any detail about that. "If we did get into a position for example where there was no deal, I'm very clear and I think a lot of people - certainly in Scotland but I suspect across the UK as a whole - would think that in those circumstances, no Brexit was absolutely preferable to a no-deal situation, which would be devastating for so many aspects of our economy and society." Mrs May has insisted that she wants to have a deal in place by the time the UK leaves the European Union in March 2019. She told the BBC's Andrew Marr Show there had been a "a real spirit of cooperation" between negotiators from the UK and the EU, seeking "a deal that is in everybody's best interests". She said: "What we want is our own free trade agreement with the European Union. It would be a free trade agreement to cover both goods and services, and what I want to do is to ensure that as we look at the Brexit deal going forward it's important we recognise why people voted to leave the European Union here in the UK. "That's what we mean when we talk about having a free trade agreement which isn't modelled on somebody else's agreement, but is actually the right one for the UK."